Sometimes I feel the best friends I ever had were imaginary. There are very few people to relate to, and the friends I had were in the stories I could escape to. The life of a vagabond, a Third Culture Kid, and a young man trapped lost between cultures in some metaphysical space run parallel to the most common telling of the Japanese tale of Urashima Taro. One day a young fisherman named Urashima Tarō is fishing when he notices a group of children torturing a small turtle. Tarō saves it and lets it to go back to the sea. 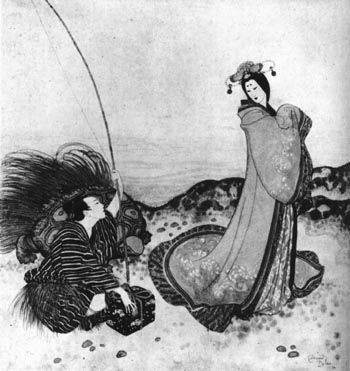 The next day, a huge turtle approaches him and tells him that the small turtle he had saved is the daughter of the Emperor of the Sea, Ryūjin, who wants to see him to thank him. The turtle magically gives Tarō gills and brings him to the bottom of the sea, to the Palace of the Dragon God (Ryūgū-jō). There he meets the Emperor and the small turtle, who was now a lovely princess, Otohime. Tarō stays there with her for a few days, but soon wants to go back to his village and see his aging mother, so he requests Otohime’s permission to leave. The princess says she is sorry to see him go, but wishes him well and gives him a mysterious box called tamatebako which will protect him from harm but which she tells him never to open. Tarō grabs the box, jumps on the back of the same turtle that had brought him there, and soon is at the seashore. This story was retold to me in various forms, but this was the most common telling of the story and the first one I heard. In many ways, I feel this is a myth that some Third Culture Kids and Asian Americans relate to. Hearing it again from a Japanese professor made me reflect with some sadness about the life I have had and currently live. One meaning I derive from it is that when you leave a place and come back, it’s never the same. Sometimes the place changes, but many times, it’s because you change. This is repatriation, or returning to the home country you came from or what was your passport country. In my story, I left the U.S. when I was young to grow up in Hong Kong and Manila. For years, I was angry at the culture shock, and always thought nobody understood me (even in international school) because I was American, and Asian American. When I returned to the U.S., to my horror, the place I was longing for was not what I remembered, even after only the first year. The way I talked, slower, more enunciated English, the realization that everyone talking around me with a similar accent was not a fellow foreigner like me in an expat community, and my manners were not the same. Training myself to realize not every American accent was someone I knew and talking to me, realizing the immigrants with Asian accents had the same adjustment problems I did, and being ostracized for my difficulty coping or re-adjusting to life in America. And by the end of a short time frame of mere weeks, I was back on a plane to what I thought was my comfort zone in Manila and Hong Kong, only to realize a short time overseas still changed me. Likewise, the few Asian Americans I’ve met who go to their parents’ homeland with their parents: their parents discover the language they speak is no longer the same; and the place they longed for is lost in time, not somewhere they can return to by hopping on a boat or a plane. I am not the man who left Vietnam during the war with the U.S. who discovers his home is lost in time thirty years after, nor am I his son who discovers Vietnam and tries to comprehend the home his father told him stories about growing up before going with him there for the first time. Who am I? I’m not one of those seeking a way to be recognized in America, their right to call it home too, for it ceased to be my home the moment I left it the first time, the same time Urashima got on the turtle. I’m not one of the backpackers seeking paradise, an escape, a utopia, a home away from home, for there’s nowhere to run to or run from: I have no home. What was my home? My home was my father, the man I loved more than anyone else. Whether he was in Manila, Hong Kong, Bangkok, San Francisco–no matter where he was, that was my home. Yes, the apartment I lived in longest was in Manila, but take away my father, and it’s an empty place. When I left my father that last day in Hong Kong in February of 2010, our last day in Manila afterward too, I came back two months later to watch him die in a hospital bed. In two months, California, Hong Kong, Manila, and Bangkok all died, for they would never be the same. Would Urashima have left if he knew he would never return to his love? Caught between home that he left, the love of his life, where could he be that would make him happiest in this dilemma? The road ahead of me now isn’t my search for paradise. I’m looking for a place called home. But where is it? Home is where the heart is. I keep moving because my heart is on the road. And until my father died, my heart and my home always knew I could return to him. Family, home, community? All lost on me now. No country is my own, no people are mine, no home exists for me to physically return to. As of today, I am the lone wolf, the world warrior, the global nomad, the adventurer. Two years ago this month, I lost my father, this year, I finally begin the journey to search for home–whatever it is, not wherever it is. Is home a place where my dog and my lover await with the door open and a loving embrace to welcome me with? Is home a frame of mind like paradise is? Some say the answers come from within, but I say the best way to discover who I am is to travel and find what is habit, what is adopted culture or behavior, and what within me remains constant wherever I go. This entry was posted in Arts, Asian and Asian-American, Life, Third Culture Kids, Travel. Bookmark the permalink. For a TCK, home is more about relationships. I would have no trouble leaving where I live now even though I have lived in this area for about 18 years now. But it is the relationships that are home. Being a tourist is an empty experience unless you share it with someone. As a Christian I make the following observations about people mentioned in the Bible. Eve was created because Adam would be lonely Gen 2:23 The man said, “This is now bone of my bones and flesh of my flesh; she shall be called ‘woman,’ for she was taken out of man.” Without Eve I think Adam would have not someone to share his life experiences with. How much greater the loss when someone you have shared life’s experiences with dies! How great the loss when everyone you knew is left behind in another country and all that you observe in your new country is strange and you are rejected as a stranger by those around you. I relate too to the Patriarchs in the Old Testament. They are the men and women following the calling of Abraham to a land promised to him and his family. Something that he never saw in his lifetime but that the new testament expresses in it being a land of Faith in God. His life and the life of his Children down to Joseph was the life of the Nomad. Travelling from place to place for new pastures. Their wealth not expressed in posession of land but of livestock. Who knows where they would be camping out in their tents (tabernacles) next week. Yet for Abraham, he had direction and purpose in his life. His faith was in God to lead him. As for me, my direction in life? I too seek a country. Though I live where I do now it never feels completely “home” for me. The home I seek is an eternal home, through faith in the promises of God. The “home” we can have here will never truly feel home to me. It’s really funny how much I can relate to this post. It’s true though, home for most of us TCKs is no longer a physical tangible place, but rather people, and because most of the time the people we love are scattered all over the world, they carry a piece of our home with them just the same. I’m really sorry about your father. I am just as close to my parents and sometimes I really dread the day in the distant future when they leave this world and then I would truly feel homeless. If you read earlier back and about me, you’ll realize there’s more, and in my eventual book, you’ll see that I am a minority of minorities within the TCK community. I’m not the only one, but generally, I don’t relate just because someone is a TCK son of a business/diplomat/missionary/military parent. There are those who were refugees, dragged around the world and lied to, or just wandered lost trying to find home and realizing that home is lost in time, not in place.